-- Flaura Koplin Winston, M.D. Ph.D.
As a physician I often have the privilege of comforting the sick. There is no more beautiful smile than one when the tension subsides, even for a moment, in the worried face of someone who is ill or injured. The smile is gentle, not forced, without grimacing. The eyes smile, too, with little creases at the corners. The sick person assumes a more relaxed posture, listening with a direct gaze. The muscles in the sides of his face, forehead and jaw relax. If you notice any of these signs of relaxation in the sick, then you have truly brought comfort to someone in need. 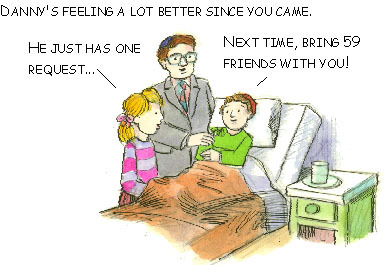 I concur with the rabbis of old who believed that visiting the sick "takes away a sixtieth of his pain" (Nedarim 39). Many of us feel awkward or frightened around those who are ill. It is possible that part of the reason why visiting the sick (bikur holim) is a mitzvah is because it can be so difficult for some. Remember that your children will pick up on your fears and may internalize them. In the short run you may not realize this as a problem, but in the long run, they will be unprepared to deal with the experience of illness and injury in loved ones (including their parents as they age). It is an important lifelong skill to teach your child how to visit and comfort their sick friends and relatives. I want to assure you that comforting the sick can be one of the easiest mitzvot to perform. Keep in mind the wisdom of Rabbi Kushner. Just being there with someone in need, relieving them of the loneliness of illness, is vital. No need to teach your child the right things to say. Encourage them to just listen. In fact, saying things like "Don’t worry, things will get better," or "I know someone who has it worse than you" can be worse than saying nothing at all. What is most important is that the sick person should not feel as though he is entertaining you and your visit should not cause stress or embarrassment. The Talmud wisely advises that the sick should not be informed of anything that may cause heartache and more pain. Keep the conversation light. Remind your child to avoid arguing. Practice and teach your child the art of listening. Before you visit, call and ask if it is a good time to come and listen for hesitancy. Keep in mind that the person might be contagious or have low immunity and visits by children might not be appropriate. In situations when you cannot visit, phone calls, cards, or Internet messaging are great alternatives. Remember an important goal: relieve the sick of their loneliness. This summer, when friends had to leave a sick child to go to camp, they came up with a creative way to let their friend know he wasn’t forgotten. They painted their chests with his name and had the camp take their picture to post on the web for their friend to see! If the time for a visit is good and the person can have child visitors, ask the child’s parent or the patient what the child might see – an intravenous line, a bandage? You can let your child know about things that might be scary by letting him know that the medicine is helping the person get better. When you arrive, teach your child to greet the ill person by asking, again, if this is a good time to visit. If it is not, prepare your child not to be disappointed. This conveys that you are not in a rush. If it is, find a seat and sit down. Even if you can only stay for five minutes, don’t rush it. It is not about the length of time, it is about the quality of the time that you spend. Don’t stay too long. Visits should last no more than 15 minutes unless the person wants you to stay longer. Keep checking in to make sure that they are still up for visitors. The Talmud goes further to recognize that you should not visit too early or too late in the day because it could be demanding and that in the early days of an illness, only family and close friends should visit. You should stay with your child for at least the first visit to monitor. Try to make the visit as natural as possible. If your child is visiting a sick friend or the child of a sick parent, bring a selection of games or activities that they can enjoy together. A joke book, magazine, or a puzzle can be used together and then left for the child when he is alone. If you are visiting an adult, the child might bring a card that he made or an art or writing project from school that he is willing to share or give. You might bring magazines, a music CD or a nice perfume. In a genuine way, teach your child to ask how the sick person is and then let them talk. Sometimes you have to allow for quiet as they think about their answer. If you feel the need to respond, you can reflect on what they have said. If they describe their pain, you might say something like, "it sounds like you have had a lot of pain." Keep in mind that if they do not respond enthusiastically to your questions, it is not personal. It could either be an effect of the medication or a bad day. Rest assured that the sick appreciates your concern. Let the conversation follow their lead. Look at their face – are they relaxing as you speak or is it making them more tense? Remind your child that while this is still the same friend that they have known, he needs to be treated in a special way when he is sick. If you notice tension, encourage your child to lighten things up with a joke. As they say, laughter is the best medicine (except after surgery when laughing may hurt. In these situations, offer them a pillow to put over their stitches when they laugh). Or just sit together and watch television. Some people might appreciate praying together. Remember that visiting the sick is not a time to impart your religious beliefs on someone else. In appropriate circumstances, Psalm 119 is the traditional psalm that is read on behalf of the sick. Many people are comforted by knowing that you will keep them in your prayers. On your own, feel free to add prayers for healing and recovery during the Amidah. Before bedtime is a beautiful time for your child to give his own prayer for healing. On Shabbat, children enjoy giving the name of someone who is sick to be recited during the Torah service. Make sure that you and your child ask how you can help. "Is there anything that I can do for you?" Come prepared with a list of things to offer that you can do without reservation. Your child could offer to bring homework, books, games, or music. You could offer to make meals, watch the other children, or carpool. Most importantly, do not assume anything, just ask. You might be surprised that a simple errand run can be a real challenge for someone who is ill or his family. Don’t forget to ask if you can bring the person’s favorite food – particularly if they have been eating institutional hospital food. Making a meal or brownies can be a particularly fun task for children. You might want to make them aware of Chai Lifeline, a wonderful organization that supports Jewish children with serious or chronic illness and their families. What do you do if the person starts to cry? Do what comes naturally. Give them a hug. Hand them some tissues. Ask if they want you to stay or to have some time alone. Again, sitting quietly next to the person without saying anything may be all that is needed. Your children are looking to you for strength and guidance when they confront illness in themselves and others. If you feel that you are not able to provide this to your child, be sure to seek support for yourself. Refuah Shlemah -- Speedy Recovery. March 2007: Can I Have The Keys? Dr. Flaura Koplin Winston is a practicing pediatrician, associate professor of pediatrics and Scientific Director of the Center for Injury Research and Prevention at the Children's Hospital of Philadelphia. She welcomes your comments, questions, contributions and suggestions for future columns.